I'm a lazy pickler. 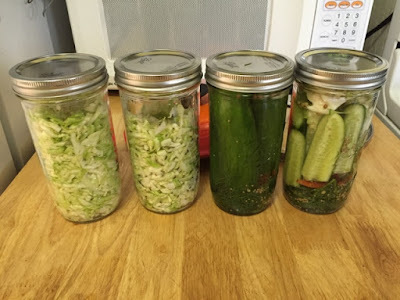 When I decided to try making my own pickles a year or so ago, I looked up the easiest possible ways, aside from "refrigerator pickles" which are a little too quick for my tastes - I like my pickles old and briney. I found a recipe that described self-fermentation, which sounded like something I could get behind. And it's brilliant. Take an assortment of pickling spices, your items to be pickled, put in a jar, and cover with water. Leave 'em on the counter for about a week, and store in the fridge. They're not shelf stable, but that's ok with me. It's so quick and easy, and I don't need to make more than. Jar of two at a time (which fit easily in the fridge) anyway. I also learned how to make sauerkraut, which is so easy it's embarrassing. Shred cabbage. Put in bowl. Add salt. Mush around with fingers until it's soft and wet. Stuff into jars. Leave on counter for about a week, opening the jars to stuff the cabbage back under the water level every few days. Store in fridge when it tastes sauerkrauty enough to you. I made a few jars today in honor of the copious amount of dill that's already grown in our garden. Summer has begun. L-R: plain kraut, caraway kraut, whole pickles (first time! ), sliced pickles with romanesco. Day 1. Sounds like my kind of pickling! :) We have jars. We like pickles. We should make some. I think kimchi isn't particularly hard too, just gotta learn what to add.